1. 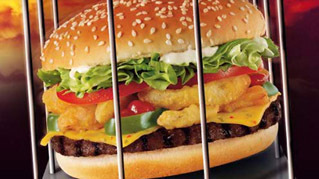 I like Burger King's weird Angry Whopper thing. As far as anthropomorphic fast food goes, this is far more interesting than, say, McDonald's Hamburgler. It also involves onion rings and I want one. 2. I love everything O'Reilly does (I was just reminiscing about one of their early books) and will be attending most of Tools of Change, their three-day conference on publishing and technology in New York City next week. I'm looking forward to hearing from Kassia Krozser, Jeff Jarvis, Laurel Touby, Bob Stein, Peter Brantley, Cory Doctorow, the distinguished Jason Epstein (author of Book Business and a great choice for this conference), the equally distinguished Tim O'Reilly himself, Joe Wikert, Kevin Smokler, Ron Hogan and Chris Baty on topics like e-books, XML, digital convergence, Kindles, Stanza, and survival techniques for writers in the digital age. It's a big agenda, the timing is right, and I will certainly be filing a report or two from this conference. 3.I'm looking forward to participating in a benefit reading for humanitarian aid in the Gaza Strip this Saturday, February 7 at 7 pm at McNally Jackson bookstore in Soho. This is to raise funds for the International Red Cross, though I'm not kidding myself that we're going to raise Warren Buffett/Bill Gates money in a downtown Manhattan bookstore on a Saturday night. I think the real value of an event like this is that it gives a chance for angry and concerned people to share ideas and express hope together. 4. On Friday, February 13 at 7 pm McNally Jackson is also presenting How History Was Made: Books That Inspired A President, a panel discussion about the admirably literary roots of our current President, featuring Laura Miller, Colm Toibin and Eric Alterman. 5. The February Words Without Borders features graphic fiction from around the world. WWB is also sponsoring a discussion of Miguel de Cervantes' Don Quixote this Thursday, February 5 at Idlewild Bookstore in New York City, featuring translators Edith Grossman and Eduardo Lago. 6. I get interviewed by Finn Harvor at Conversations in the Book Trade. 7. TRUTH FAIL. I am being very careful to keep my memoir entirely truthful, but I've already had to fix two minor mistakes after searching through old paperwork to verify my facts. I confused my salary and job title in 1994 (after I got a big promotion and raise) with my salary in 1993, and I also confused two book publishers I worked with in the 90s -- it was McGraw-Hill who offered me a contract to write a book on client-server programming with Sybase SQL Server, not Manning (which would eventually publish my book Coffeehouse: Writings From the Web). The first mistake was caused by rewriting: I had originally set a scene in 1994, and after I decided to reset the scene in 1993 I failed to adjust certain details accordingly. The second mistake was simple confusion: my friend Len Dorfman had been the book scout responsible for both this book contract and my later one with Manning, and I remembered incorrectly that he only scouted for Manning, when in fact he also worked with McGraw-Hill. This truth stuff is harder than I thought! Interestingly, author Tim Barrus (a friend of LitKicks, who got a lot of attention after publishing an award-winning memoir as a Native American named Nasdijj) has posted some provocative comments to one of these posts about the ideal of truthfulness in autobiography. This a complex and fascinating topic (I've also written about it with regard to Bob Dylan, JT Leroy and Ishmael Beah), but I pledge to uphold simple and strict standards with my memoir, and am embarrassed to have had to fix mistakes so quickly after beginning the project. I hope this disclosure is sufficient punishment. 8. I didn't realize that Sara Nelson, the highly-regarded but laid-off recent chief of Publisher's Weekly, came up at Inside.com. Inside.com is one of the Silicon Alley companies that will show up in later chapters of the above-mentioned memoir, since I had many conversations about content management technology with Deanna Brown when she was founding the company at the height of the dot-com boom in late 1999 and early 2000. I almost joined the Inside.com team but, as strange as this sounds, I was too busy. I probably would have made more money if I had gone, and I would have gotten to work with Sara Nelson too. Hmm! 9. Yahoo music blogger Rob O'Connor's attempted put-down of Bruce Springsteen's Super Bowl performance is weak. "You may find this hard to believe," he begins before letting the insults roll, "but I am a Bruce Springsteen fan." Yet this "fan" is surprised that Bruce cajoles the audience, slides into the camera, pulls hokey comedy routines and "kills us with show-biz overkill". Actually, overkill is the essence of any Bruce Springsteen/E Street Band concert. He's an extremely dynamic and energetic performer, which is one reason he can sell out stadiums for dozens of nights in a row. Rob O'Connor was apparently expecting Bruce to stand still and whine into a microphone while fondling a guitar like Jason Mraz, which only proves that he has never been within fifty miles of a Bruce Springsteen and E Street Band concert and should stop lying about being a fan. As matron of the arts, here are some things I don’t want to read about: new books by Philip Roth (I prefer the old ones, which were funny). New books by Cormac McCarthy. New books by any male writer prone to complaining about the indignities of old age, either general or prostate-specific, or or having his male protagonists do the same. New short-story collection by Alice Munro. Instead of wasting eight hundred words, just say it’s every bit as wrenching and finely wrought as the last short-story collection by Alice Munro, and be done with it. 11. The politically conservative Pajamas Media blog ad network has gone out of business, and is falling over itself on the way down. Just in case anybody thinks this means the blog ad format is to blame, I'd like to point out how happy I am with BlogAds.com, the company that sells ads for LitKicks. I make a couple hundred dollars every month via BlogAds -- sometimes more, sometimes less, but the business model appears to work just fine when sensible and realistic expectations are applied. 12. Tom Stoppard on his Cherry Orchard (via Maud). 13. Justin Taylor of HTML Giant appreciates a George Saunders short story, and explains exactly why. 14. From Boing Boing, this is your brain on fiction. Or maybe on an angry whopper. 10 Responses to "Angry Whopper"
One could argue that any memoir is fictional unless audio and video taped real time and then the perspective of the camera man could be faulted, eg, the JFK assasination. An authentic autobiography would be one that had errors, especially if relying on memory. I read the Harvor interview and must say: I hate reading a monitor. My eyes get so tired after a day of reading online and offline that I can't even watch TV. Last night was one of those days and I went to sleep at nine and I don't think my post-dinner cocktail had anything to do with it: I wrote longhand and then typed four pages and started Updike's Terrorist and scanned two magazines from last year that I still hadn't read. Why someone would want to read from a screen 14 hours a day is beyond me. I'm with Jennifer Weiner. Roth and McCarthy et al -- who needs them? We have great current literary fiction from Roberto Bolano and others -- as good as anything that's been published, and certainly better than those literary lap dogs. On memory and memoirs - my mother remembered walking home one night and turning the corner to her street. she was confronted by a mob of black people, waving their arms and moaning. Problem: the town in which she grew up was completely segregated: there were no minorities of any kind in the town, let alone on her street. She believes it to have been a dream that she remembers as reality. I concur, and would add that the dream probably dramatized her great fear of minorities. I remember things that I know didn't happen. What about the veracity, then, of memoirs, despite the best intentions? I'm tempted to call mine a novel, change some names, and then blab everything, including my night with Serena Williams and the Olsen Twins. Is there a Freudian vegetarian in the house? I think someone should write a book called Chicken Soup for the Vegetarian. responding to the request for a freudian vegetarian - i don't know any, but i DO know of a 'feminist psychoanalyst'. she has written a book, 'menstruation and psychoanalysis,' available on amazon. 'Chicken Soup''couldnt hold a candle to 'Duck Soup' The poultrian panacea is no match for a good Freudo/Marxian quacker. 1.Yes, I can not beleive that I like the Angry Whopper so much,it is nonboring fast food which is a step in the right direction. As long as they don't put the food value numbers on the thing will be fine. 2. The Boss was prime time show boating at the SuperBowl, but what should it be for a 12minute half time thing on TV? I am writing a book with Mary Scriver called Kickstart. A lot of the book is an exploration of self, identity, and writing. My stuff is all over the place. Up one wall and down another. Scriver's stuff is piercing and leveling. We are very different yet there is a reciprocity that compels me to see this through no matter what it takes. Writing memoir will take you places you thought you knew, and writing memoir will take you places you never knew existed. Levi, I do so wish you well on this journey. It is never done. Scriver sent me some work she did today on Kickstart, and I will share the last thought with you. constantly taps the core magma of the identity. One's ability to feel that, shape it, and relate it to the lives of others is what creates good books. Too many people have distanced themselves from the poetry and emotional truth of books." Levi, in answer to your dilemma(sic), you could call your memoirs "creative non-fiction" like I called my books. Moreover, you would be freed up to confuse cities and dates--even change names of people. Total recall is a hard thing to do anyhow. Besides, any way you slice it, your memoirs were on the cutting edge of technology which might sell better. Mine haven't been picked up yet, and I've been querying them for 22 years going on 23--count 'em. My memoirs are called "EXPERIENCE FOR SALE, Volumes One and Two". Also, I had a subtitle "E Pluribus Unum" which the copyright office didn't like. However, both volumes are copyrighted (1986) and I still periodically sent them out to agents and/or publishers. Good luck with yours.